and I do have a little girl who thinks Valentines Day is amazing! So..I have been doing some Valentine crafting. so that is just what I did! so lets cut to the chase! Now there are two options when making the hearts. Here they are! Here is the first option. 2 - Wrap the end down and twist them together. 3 - Hold the bottom, and using your fingers round out the top n either side of your original fold. But I thought some people might have a bit of a harder time forming the heart...so out came the cookie cutter, and the second option. 1 - fold the pipe cleaner in half - this is the top indent on the heart. 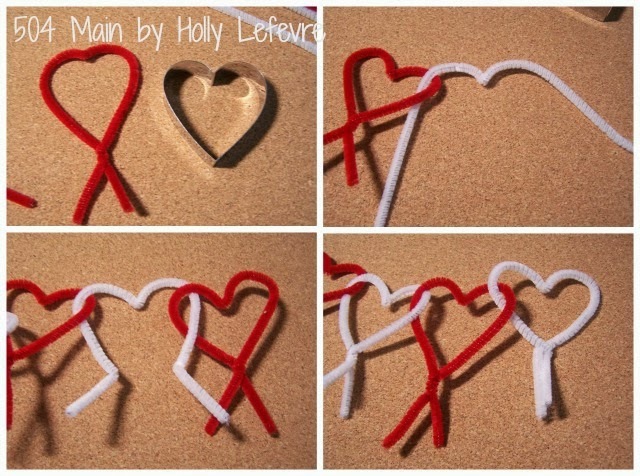 2 - Lay a heart cookie cutter on the table. 3 - Hold the fold into the heart indent at the top, and wrap one side down to the bottom, and them the other - you will be using all of your fingers for this...but it is totally doable. 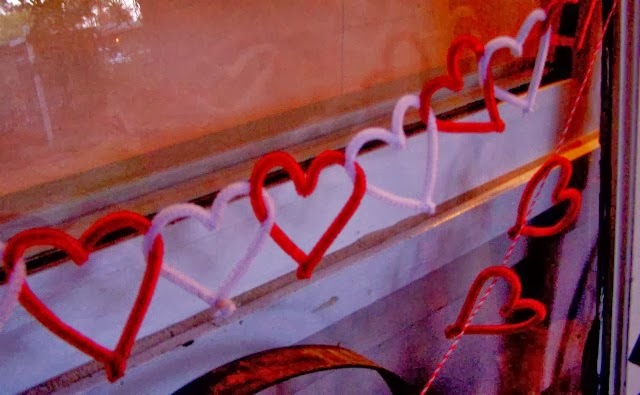 4 - Twist the two ends together once (if you are planning to link them) or 2-3 times if they will be "stand alone" hearts (like on the bakers twine example). There may be some excess, depending on how large your cookie cutter is. Start with one heart; with a second heart, gently untwist the bottom (doing your best to keep its shape); Hook one side through the complete heart; add another complete heart to the other side; twist the bottom of the second heart back together. Continue this pattern until you have the desires length. Finish by trimming excess pipe cleaner. NOTE: as you link your hearts be consistent as to if you are going to hook on top of the previous heart or from below. This goes for both sides. It prevents it from twisting all weird! 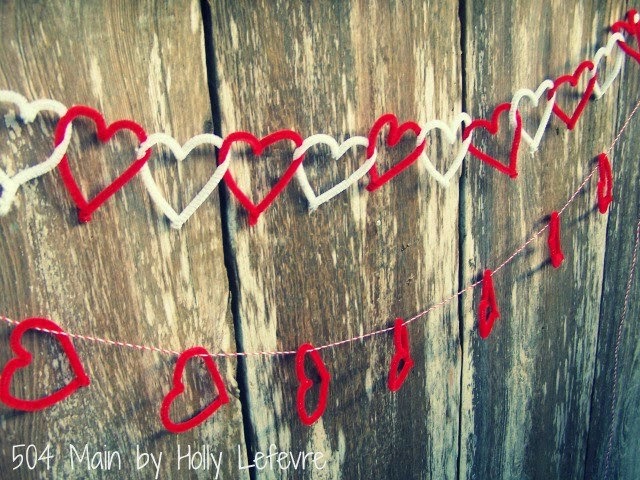 Just simply add the finished hearts to the string and hang - the hearts will be free to move around. 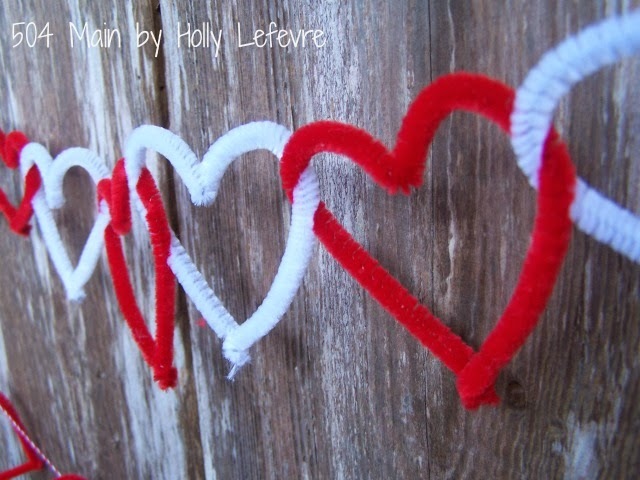 If you do not want them to move around, twist the string around heart heart once or twice or make a knot. 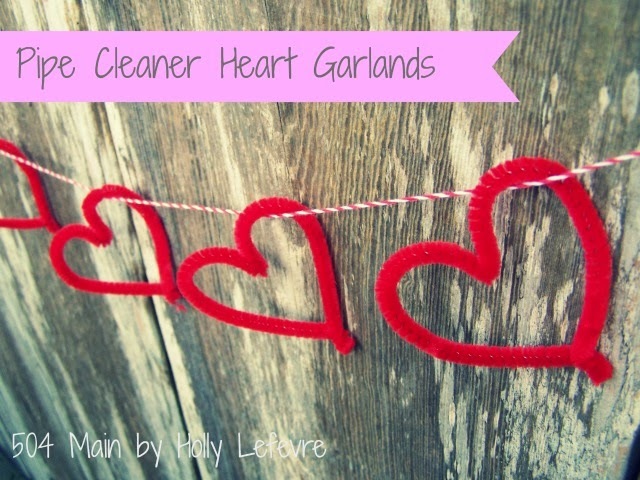 I just love the sweet simplicity of these little hearts. mine are on an old window on my porch! our house will be covered in pipe cleaners! 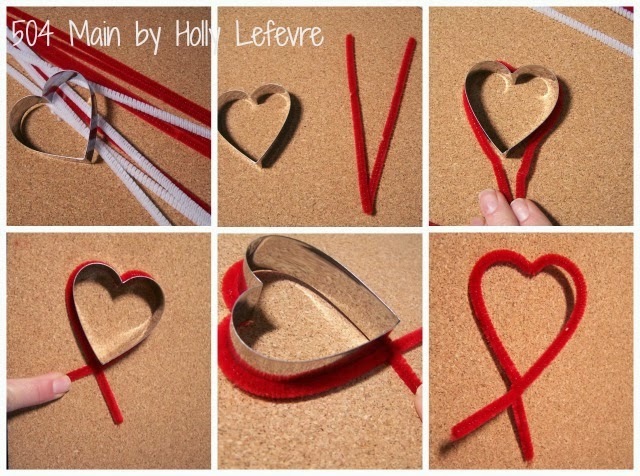 What's your favorite Valentine Craft? Such a great idea, Holly! Sweet! Love the intertwined ones. The cookie cutter is a great idea for the perfect shape. I never thought of that. I guess you could do that with a lot of basic designs too. Neat! What a cute idea! I can't wait until my granddaughter is old enough to do this!